In early January 2017, the percentage of completion of the EFRA Project exceeded 54%, compared with the scheduled target of 37.2%. Two new chimney stacks now overlook the construction site. Four large tanks of the coke dewatering section are being prefabricated near the CHP plant. An enormous HVDU column is waiting to be mounted, after a huge lift has been assembled, which will also set other gigantic apparatus on their foundations: a distillation column, two DCU reactors and tanks. Over 90% of the design work has already been completed, the percentage of completed procurement and supplies has exceeded 78%, while progress on construction and assembly work has reached 20%. At the beginning of January 2017, the percentage of completion of the entire Coking Complex project (comprising the Delayed Coking Unit, Coking Naphtha Hydrotreating Unit, as well as Coke Storage and Logistics Facility) reached 55%, with construction and assembly work alone completed in 15%. Preparations were continued for transporting and erecting heavy, large-size apparatus. In addition, steel structure modules of the DCU reactors are being assembled. The modules will be mounted in February 2017, as part of the operation to erect and install both DCU reactors. Four tanks of the coke dewatering section are being prefabricated near the CHP plant. KT’s subcontractor, Mostostal Zabrze, continued to prefabricate pipelines in Kędzierzyn‑Koźle. Approximately 30,000 weld inches were made, out of the total of 112,500 planned for the prefabrication phase. The percentage of completion of the HGU project has exceeded 58%, with construction and assembly work alone completed in 20%. More and more apparatus is being mounted on foundations and superstructures, including reactors, tanks, heat exchangers and the reforming furnace stack. is already completed,” lists Stefan Godlewski. Laying of underground networks and assembly of the ST10 structure are also nearing completion. 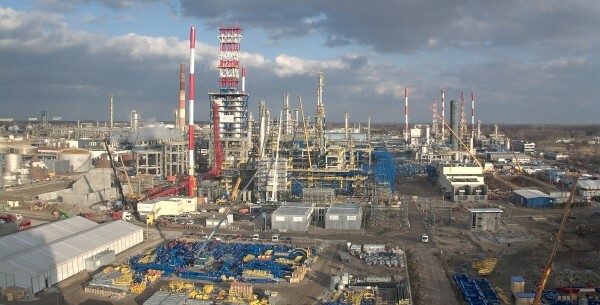 Pipelines are being prefabricated on the premises of KB Pomorze, KT’s subcontractor. Over 6,000 weld inches have been made (out of the planned 28,000). Work has been completed on the underground section of the natural gas pipeline which is to connect PSG’s new gas reduction station (whose construction is due to start in January) with the HGU. “Przembud has almost completed the construction of cable and slop conduits, as well as the assembly of underground installations,” says Paweł Brzozowiec. “Mostostal Płock has mounted the first apparatus, E32 air heater, on its foundations; the company is also working on pipeline prefabrication and getting ready for the furnace and steel structures assembly. Pipeline prefabrication has commenced on Mostostal’s premises. Approximately 4,000 weld inches have been made, out of the planned 29,000. The team is also engaged in continued upgrade of the HDS 520 unit. Keller has completed piling work for the foundations of the DCU emergency steam trestle, as well as for the air buffer tank, thus completing all of its assignments in the area. “Przembud has laid foundations for the Oxygen Generation Unit (OGU), new air compressor and the air system buffer tank, as well as for the 9860 stripper rack. The roof is now being installed on the OGU compressor building,” says Jan Kowalski. Uniserv-Piecbud is upgrading the cooling fans of the cooling water network. Three cells have already been upgraded, while work on the other two is still under way. The first supplies of equipment have arrived, including a new cooling water pump and four oxygen analysers. A contract has been signed with LOTOS Serwis for mechanical work on several units. In December, KB Pomorze, the contractor of inter-unit connections, continued pipeline assembly on the 6-7, C-D and D‑E trestles. The majority of piping materials for inter-unit connections have already been supplied. Mostostal Płock is constructing two semi-product tanks for the DCU. The construction work is now completed and assembly is about to start. Przembud has completed construction work on the site of the hydrowax pumping station. Following a maintenance shutdown, piping of the pump station will be assembled. LOTOS Serwis has completed the modernisation of structures on three trestles (along the 6-7, C-D, D-E roads). “Work is continuing on the construction of water supply and sewerage systems along the roads, as well as on road construction and reconstruction. Underground cable conduits have also been laid. Strabag is the general contractor there, with PRI Centrum and Proelectric as subcontractors. The percentage of completion in this work area is 54.4%,” says Miłosz Puzio. Mostostal Zabrze is constructing inter-unit trestles, scheduled for completion in February 2017. The balance of work will be performed in the first quarter of 2017, after large-size apparatus has been transported to the site. “Percentage of completion of the power-supply building (GPZ4/S41/TIR) is now over 90%. Operating tests of auxiliary facilities and acceptance procedures of individual premises are under way, alongside the installation and assembly of power supply equipment for new EFRA units,” says Sebastian Demczyński. In the GPZ4 section, high-voltage switchgear and busbars have been mounted, as have medium-voltage switchboards and busbars in the S41 section, as well as DC supply systems.